In late February, UNA hosted the first 3 Day Startup workshop, sponsored by Charleston Laboratories, Inc., which is a learn-by-doing campus workshop that teaches entrepreneurial skills to university students in an extreme hands-on environment. 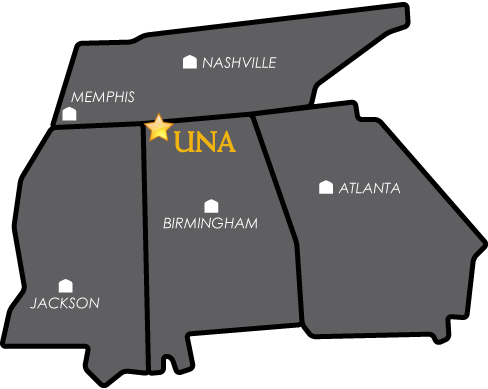 With this inaugural event, UNA joined legions of participants on 60 campuses across five continents who have collectively launched over 70 companies with more than $49M of investment. The UNA campus workshop welcomed 25 area business people and faculty members who acted as mentors to the students who created the following business ideas and initiated business plans before pitching their collaborations to a venture capital panel on Sunday evening. Smith Enterprises: A roofing and construction company that eliminates the safety issues with roof inspections by utilizing drones. IT Geex: An on campus, college budget friendly, tech support business that provides 24/7 access to technical support from other college students. Footprints: A social media app/website that allows travelers to connect with other travelers to provide users with an improved travel experience. StartSmart: A website/app that connects high school students to current college students from universities across the country to provide first-hand information about the university and specific majors during online counseling sessions. T3 Biodynamics: A company focused on amateur athletic excellence that takes performance based simulation training and provides real time feedback to the athlete that can lead to improved performance. Recruit Group: A company that simplifies the hiring process for employers by combining custom testing with resume analysis to select potential applicants for the hiring process with the benefit of reduced time and increased success. Learn more about the event at una.3daystartup.org and www.una.edu/business.